What is it about Paris that makes us want to bring it home? How can a city, leave an impression so deep, that the need to be reminded of it's beauty and charm must be embedded into daily life? 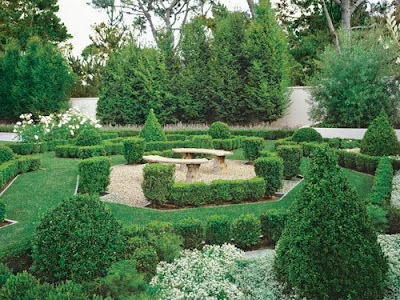 This home located in Pebble Beach, CA, has a history as romantic as Paris itself. 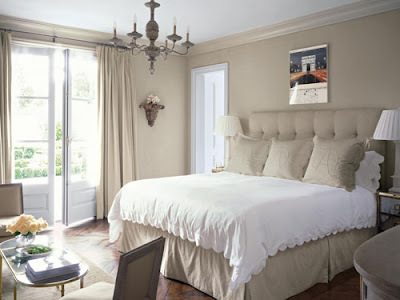 An American girl travels to France, falls in love and marries, and upon returning to America 18 years later, they build a quiet and elegant home as a tribute to the city they adore. Today, the house has been refreshed to meet the needs of a modern family, without losing it's French Heritage. In a twist of traditional meets modern meets rustic, this home remains elegant and rich with European detailing. Chevron wood flooring, lstone fireplace mantels and gold gilded frames, are set upon a backdrop of crisp whites and clean linens. Antique Limestone flooring, meets white carrara marble walls in the kitchen where veins seamlessly line up to create the appearance of one giant slab. 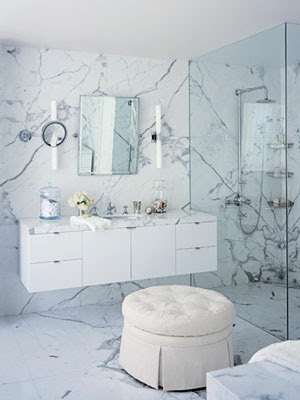 An effect that is equally impressive in the master bath, where floor to ceiling marble has been described as "being in a cloud" by the home owner. Inspired by the natural coast line of Pebble Beach, Interior Designer Betty Burgess used a soft gray palette to create calm throughout the home. .A colour that works wonderfully for showcasing antiques, art and architectural elements. 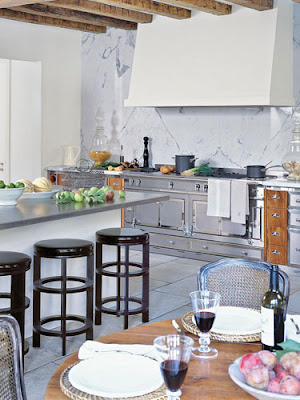 This beautiful and inspirational home incorporates all the best of french design, traditional and modern. A kitchen that feels like an escape to the countryside. You can almost smell the scent of lavender in the air carried by winds from fields nearby. While the Bathroom is reminiscent of a fabulous boutique hotel in the heart of Paris, a place to unwind after a long hard day of shopping and sight seeing.